�����While the metals remained steady this past week, we monitored many collector series displaying advances, some of them substantial. This week's HD Wholesale Market Dealer Price Guide reports higher prices for high grade Peace Dollars for several dates as a result of recent trades. The 1924 S moved up to $42,500 in MS66 and the 1927 S jumped to $36,500 in the same grade. There is a lot of interest in this series by collectors who want the finest coins graded by date. Most of these highest certified coins have minimal populations. �����The $20 Gold Liberty series has been active and strong for several months now. It is not just the common dates that have been in demand. Better and rare dates are attracting many buyers who have been very competitive, especially for the low pop rarities. This week the 1869 increased in MS62 to $16,250, MS63 to $23,500, and in MS64 to $43,500. The 1862 also advanced in grades AU58 to MS61, with the MS61 now at a Market of $22,500. The early New Orleans Mint coins showed increases in various grades with the 1852 O up to $15,500 in AU58. Keep in mind that almost any of the grades for the coins we mentioned would attract buyers at very competitive prices. �����After many weeks of increases for Morgan and Peace Dollars, there has been a slight correction for most grades from MS60 to MS65. 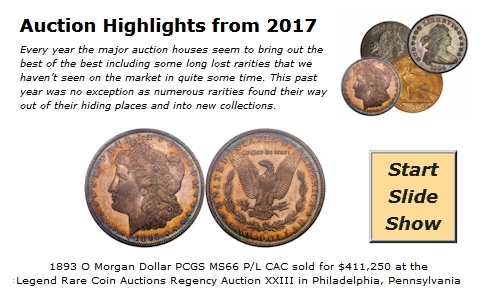 Demand appears to be steady for most grades except the MS64 Morgan where there may be an excess of supplies on the market. The Market price for the MS65 Morgan is down to $195 and the MS65 Peace Dollar is now at $180. Bags of circulated Silver Dollars are steady at $31,000 to $31,500.